Ear Warmers: the perfect messy-bun, haven’t-washed-my-hair-in-a-week-but-a-hat-is-a-bit-too-much accessory. We could all use a few ear warmers in our closet for those wild hair days! 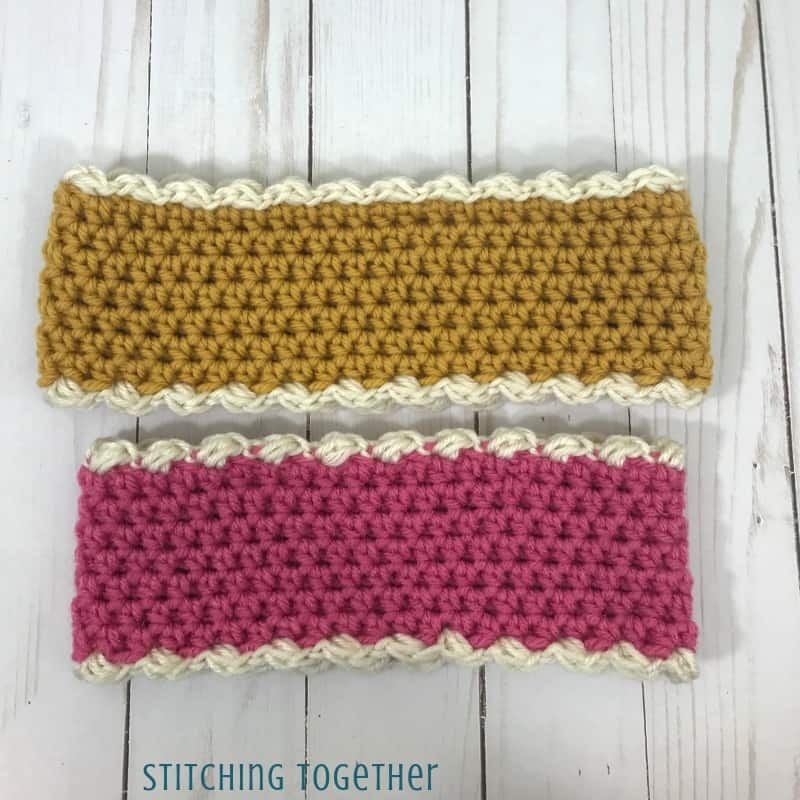 You can use this easy crochet ear warmer pattern to stock up your own ear warmer stash and make some to give away. Since we are nearing the holiday season, these ear warmers would make great stocking stuffers or gifts for coworkers! 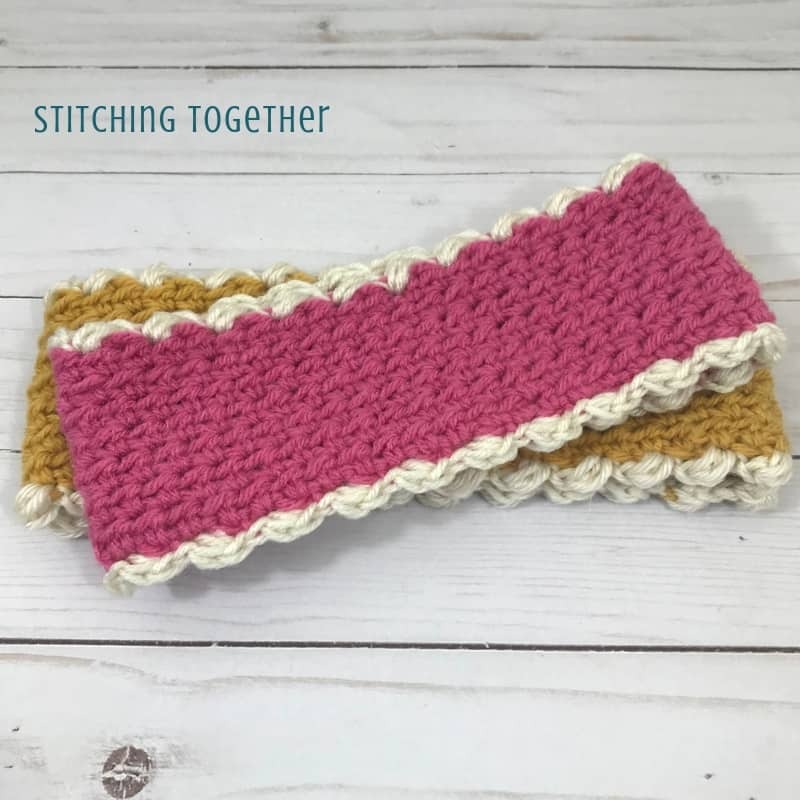 If you are looking for more crochet gift ideas, don’t forget to sign up for the Stitching Together email list and download the crochet planner. The planner has a section of crochet gift ideas which you will definitely want as we move into the giving season! As you scroll down to the free pattern you’ll see that I give a few recommendations for alternative yarn choices in the Materials section since the I Love this Wool Blend from Hobby Lobby has been discontinued as far as I can tell. If you’d like even more recommendations for the mustard color, see the Peekaboo Puff Stitch Cowl post. And, like the cowl, both sides of the ear warmer are different and uniquely beautiful. There isn’t a wrong side! You’ll also see the pattern in two different sizes: one for a smaller adult sized head and one for a kiddo in the younger range of 4-12 years old. I had fun ideas in my head of taking mom and me pictures with my baby girl and our matching headbands, but her post nap, yogurt-covered cuteness was just a bit too hyper to stay still long enough to capture many real smiles that didn’t involve her tongue sticking out. I still think some of the photos turned out pretty cute. If you’d like to make the ear warmer in a different size than the two provided, you’ll want to make sure your starting chain is an even number. It is more important that you crochet to the correct length than the correct number of chains. Even worsted weight yarns vary so much (see the Peekaboo Puff Stitch Cowl for the info on the yarn used in the sample crochet ear warmer) that one type or even color of yarn could take 50 chains to reach the correct length and the next yarn could take 60! As I said earlier, you’ll want to crochet to the correct length instead of just the provided number of chains. 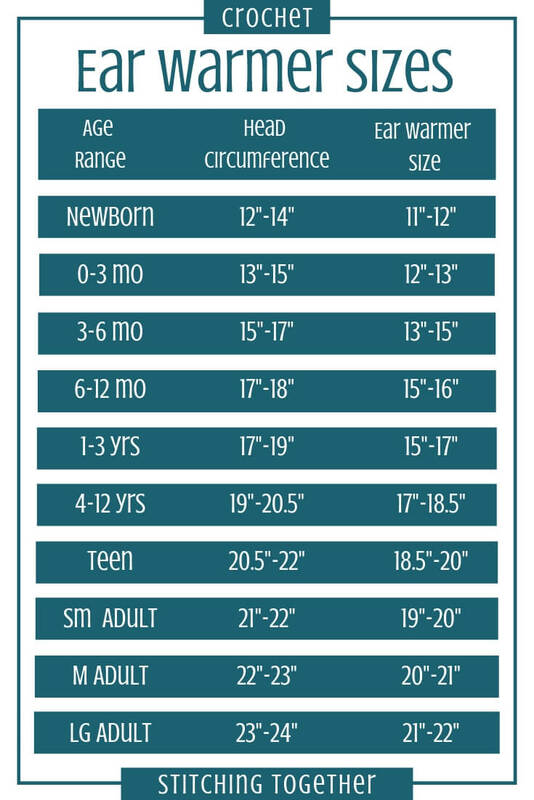 This crochet ear warmer size chart is provided to give you a general guideline for crocheting ear warmers or headbands. 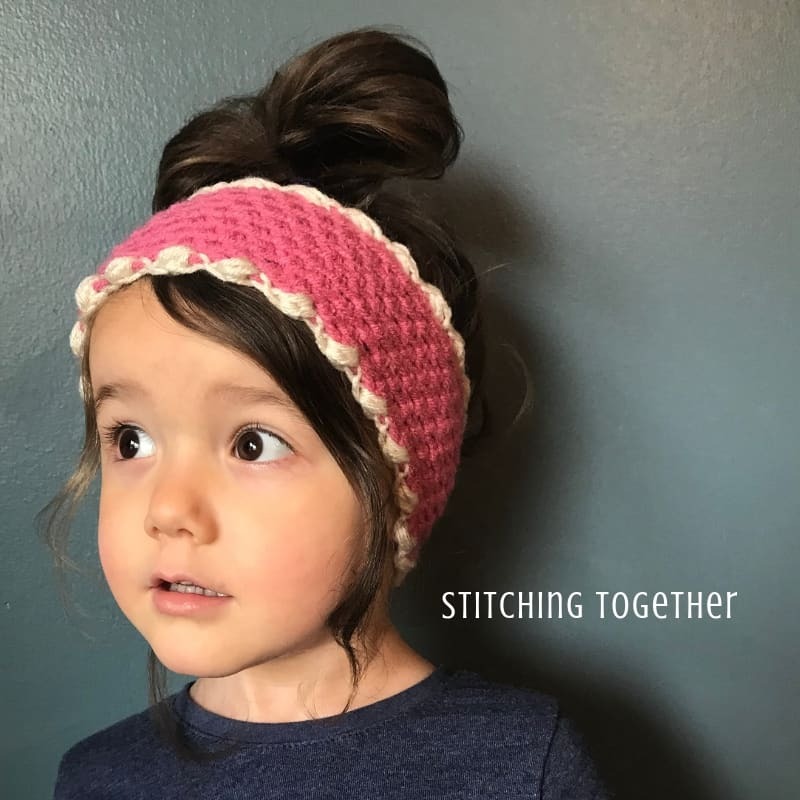 Most of the sizes assume that the finished ear warmer will stretch around two inches. However, if you are using a yarn without much stretch you may want to go a little bit bigger in the recommended size range. Save this Crochet Ear Warmer Size Chart on Pinterest! Doing a small project like ear warmers also helps you to get familiar with how you chain and how to adjust your chain. Are your chains loose or tight? If your measured chain is significantly shorter than your measure rows, then you chain tight! You may want to relax your tension a bit when you chain. Although I have improved in finding a good tension for my chain stitches, I don’t measure my chains, but wait to measure until I have completed a row or two. It isn’t a big deal to take out a couple of short rows or rounds to adjust the size and get it just right. 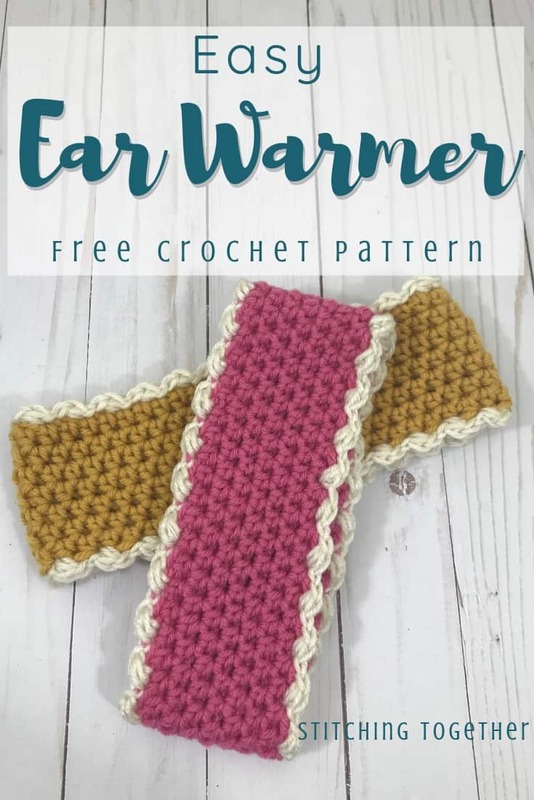 Don’t forget to save this free crochet ear warmer pattern on Pinterest! Ch 50, join with sl st to the first chain to form a circle. R1: ch 1, hdc in each ch, sl st to first hdc of round. R2-7: ch 1, hdc in each st, sl st to first hdc of round. Top border: join CC, [small ps (see stitch instructions) in the same st, ch 1, sk 1, sl st into the next st] 24 times, small ps in the same st, ch 1, st sl into last st of row (you will not sk a st). Fasten off. Bottom border: turn the ear warmer upside down and join CC anywhere on the starting chain, [small ps (see stitch instructions) in the same st, ch 1, sk 1, sl st into the next st] 24 times, small ps in the same st, ch 1, st sl into last st of row (you will not sk a st). Fasten off and weave in all ends. Ch 44, join with sl st to the first chain to form a circle. Top border: join CC, [small ps (see stitch instructions) in the same st, ch 1, sk 1, sl st into the next st] 22 times, small ps in the same st, ch 1, st sl into last st of row (you will not sk a st). Fasten off. Bottom border: turn the cowl upside down and join CC anywhere on the starting chain, [small ps (see stitch instructions) in the same st, ch 1, sk 1, sl st into the next st] 22 times, small ps in the same st, ch 1, st sl into last st of row (you will not sk a st). Fasten off and weave in all ends. 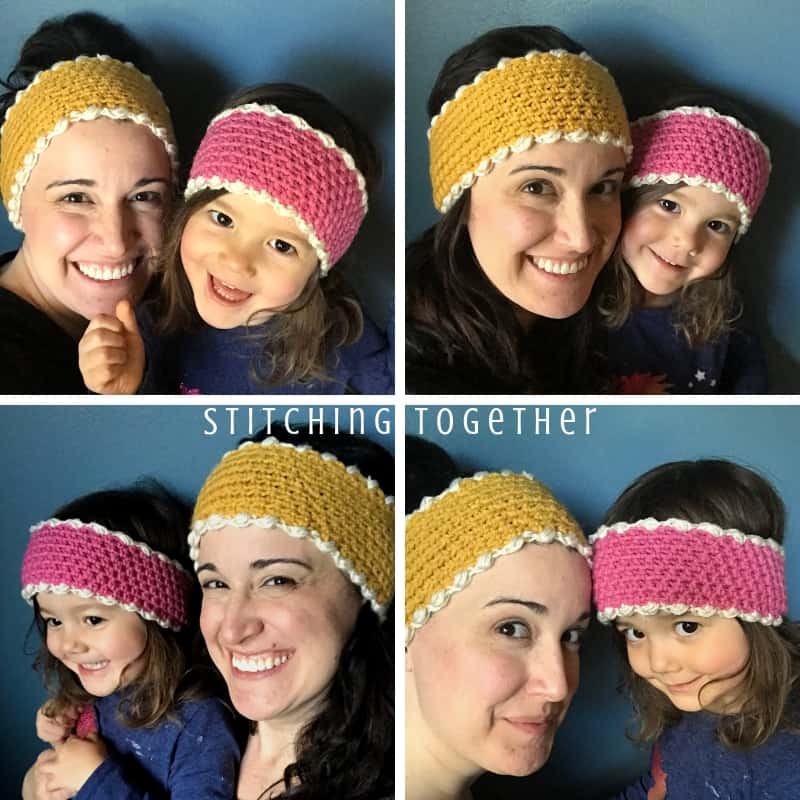 When you make these adorable crochet ear warmers, I’d love to see pictures! You can tag me on social and use #stitchingtog or upload a “tried it” picture to this pin. Love your stuff, peekaboo, country, head gear… all the alls! Thank you so much for all your encouragement and sweet words. 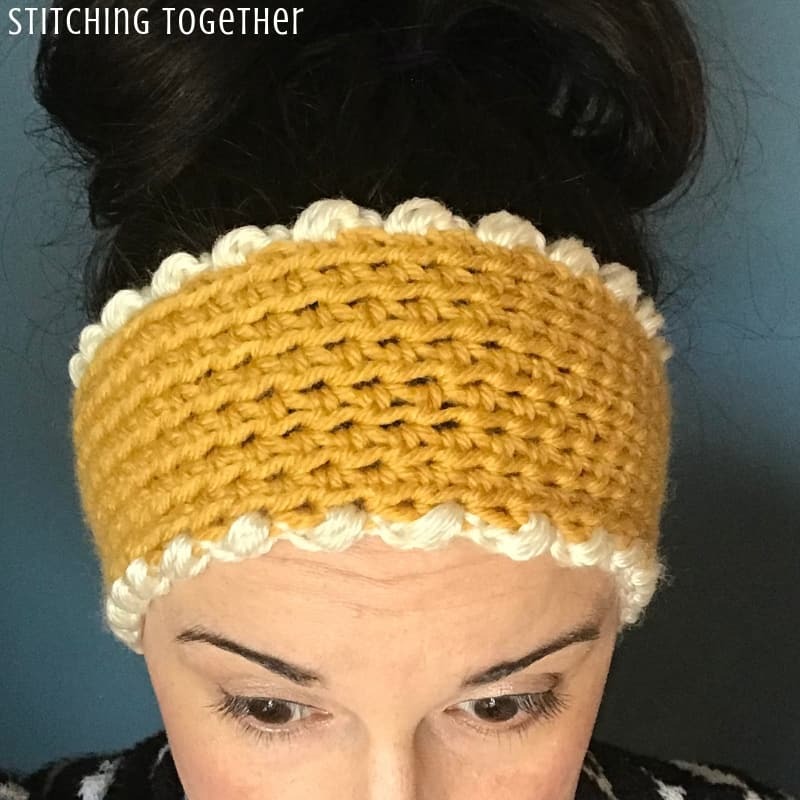 The ear warmers are so pretty and love the pattern. Will make nice gifts! Thanks so much. ?? Vert pretty. Love different stitch and sizes. Thank you so much.